Cessna-AVIC Aircraft (Zhuhai) Co.has signed agreements with the Flight Inspection Center of CAAC (CFIC) for eight new Cessna Citation XLS+ business jets. Deliveries of the aircraft are expected to take place from 2019 to 2021. 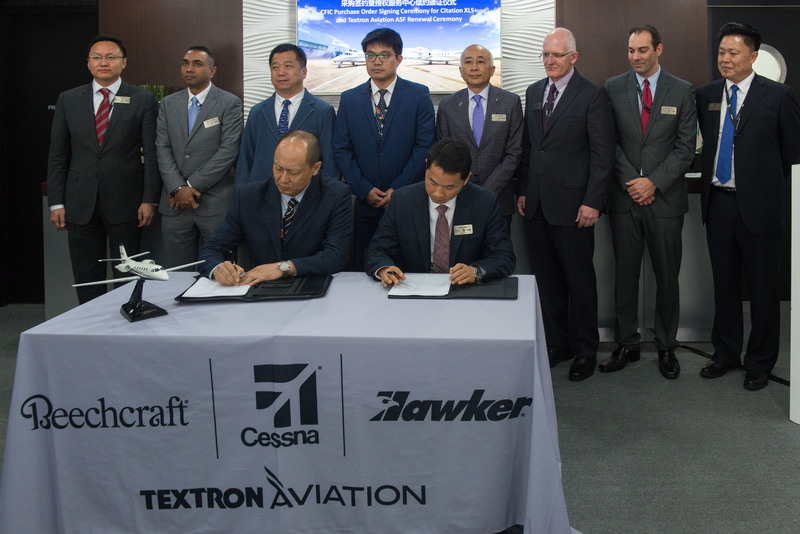 The two companies held a signing ceremony today during the Asian Business Aviation Convention & Exhibition (ABACE) at the Shanghai Hongqiao Airport. The eight XLS+ aircraft, which will be outfitted with special flight inspection equipment, will facilitate the expansion of the CFIC fleet and its ability to respond to highly challenging missions throughout the region, such as fulfilling inspection and certification missions for the communication, navigation, radar and flight programs of newly built airports, as well as to perform regular flight inspection missions for airports already in operation. This will help ensure a smooth implementation of airport construction plans and safe operation of corresponding air routes during China’s Thirteenth Five-Year Plan period. According to the Thirteenth Five-Year Plan for the Development of China Civil Aviation, jointly issued by CAAC, National Development and Reform Commission and the Ministry of Transport, China will complete work on 30 airports, commence work on 44 new airports, reconstruct and expand 139 airports, relocate 19 airports and conduct 51 additional projects to accelerate the construction of airports and lay the foundation for sustainable development of civil aviation. The Plan promotes the construction of more than 200 general aviation airports and encourages qualified civilian airports to concurrently provide general aviation services. “The successful purchase of these aircraft is only possible with the great support for flight inspection operations from the Party Group of Civil Aviation Administration of China, which is significant to the fleet construction of CFIC and ensuring civil aviation transportation safety,” said XIONG Jie, Director of CFIC. CIFC’s existing fleet of eight 560 XLS/XLS+ jets continue to perform inspection missions at many high-elevation airports throughout the region. The XLS+ is ideally suited for this mission due to its excellent high-elevation performance, ability to operate in severe weather and harsh environments and economical operating costs. Business owners have consistently chosen the Citation XLS+ more than any other aircraft in the light midsize category for its unparalleled combination of superb performance, comfort, ease of operation, range of mission capabilities and favorable operating efficiencies. The Citation XLS+ equips operators with speeds of up to 441 knots (817 kilometers/ hour) with a maximum economy range of 2,100 nautical miles (3,889 kilometers), a takeoff roll distance as short as 3,560 feet (1,085 meters) and climbs to 45,000 feet (13,716 meters) in 29 minutes. With outstanding high-elevation performance and navigation system precision of RNP 0.3, the Citation XLS+ can take off and land at airports with an elevation of up to 15,000 feet (4,572 meters) and meets the standards of ILS CAT II. Textron Aviation offers the most comprehensive solutions using innovative technologies and our advanced engineering techniques with the broadest lineup of special mission platforms in the industry. With its entire product range available in special missions configurations, Textron Aviation’s family of aircraft, including single and multi-engine pistons, turboprops and Citation jets, provide the high performance and flight characteristics required to fit mission profiles such as air ambulance, float operations, flight inspection, aerial surveillance, training, utility transport and more. All aircraft are backed by the industry’s most capable global service network.